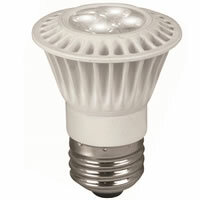 This 7 watt LED Par16 from TCP generates 350 lumens of light, allowing it to be a suitable replacement for a 35 watt halogen bulb. This Par16 LED has a 20 degree beam spread and is dimmable. Its 3000K color temperature provides a warm white light. Very low heat generation – excellent for sensitive display lighting.